Watching full motion video on a display that you can roll up and stuff in your pocket is a tantalizing prospect. 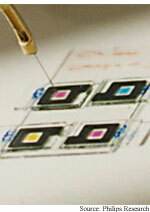 An electronic ink that changes about 70 times a second brings this vision closer to reality. The technology is all about combining oil and water. Magnetic memory will soon put an end to the daily annoyance of waiting while your computer boots up from its hard disk. These chips that hold data when the power is off might also be capable of a lot more. Adding a few extra wires to each memory cell could turn the chips into efficient computer processors. Computers have become quite powerful over the years, but they remain less than reliable. A concept widely used in mainframe computing in the '70s and '80s -- the virtual machine -- could keep computers safe and sound in the age of hackers and viruses. Playing tricks with light -- speeding, slowing and storing it -- is becoming a popular pastime among physicists. The effects could eventually be used to improve communications and data storage and help bring about quantum computing and quantum communications. A crystal that slows and speeds light broadens the possibilities. Process orders nanowire arrays... CD writer generates holograms... Nanotubes boost storage... Nanotubes harvest electrons... Bacteria make more electricity... Design enables large neural nets.